More background info: When it says in the above that the "bodies" of the emperors were laid to rest here, that means: the embalmed bodies minus the intestines and the hearts, which were traditionally buried separately! 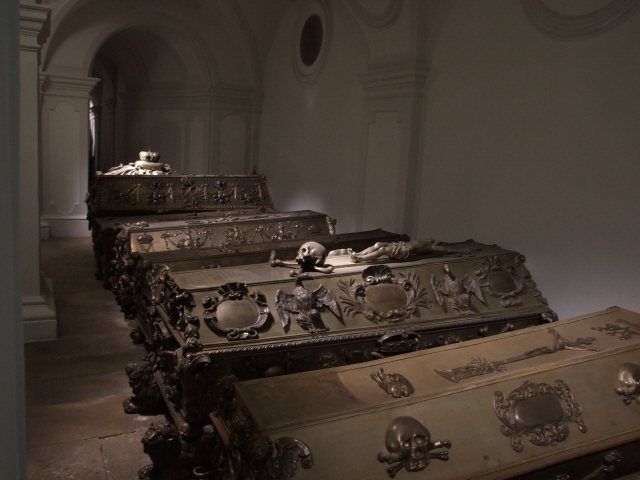 The former can now be found in large urns in the catacombs of St Stephen's cathedral and the hearts are stored in a small mini crypt in St Augustin's church, which is part of the Hofburg palace complex. 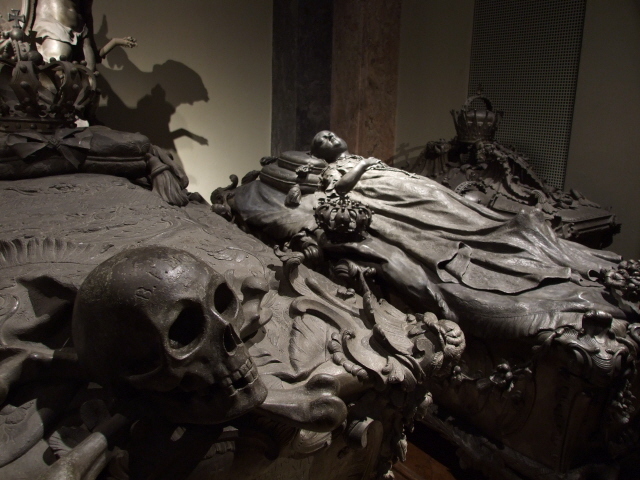 The Imperial Crypt goes back to the first half of the 17th century and contains the remains of some 140 persons or so, including 12 emperors and 19 empresses and queens, amongst them the great Maria Theresa, who is given the grandest sarcophagus of them all. It would go too far here to get into the details of all the "inhabitants" of this crypt – those really interested in this should be able to obtain all the relevant information in the crypt's shop. The place is listed here not so much for all that imperial history it's connected with but simply for its grandness in the "celebration" of death. In that sense it is one of the major sights in Vienna that proves this city's special relationship with death and the morbid in general. The name "Imperial Crypt", by the way, is just a loose translation of the original German 'Kaisergruft', which is the official name of the place – although it is more commonly also known as the Kapuzinergruft, 'crypt of the Capuchins', after the church/monastery at/under which it is located. What there is to see: From the entrance you first descend some stairs into a plain white anteroom, then you enter the first of the crypt's rooms, its oldest part is the small founders' vault through a gate ahead, the niches inside the wall to the left are a recent addition. The main hall stretches out to the right. This is already one of the best bits, especially the sarcophagi on the right-hand side bearing elaborate gothic ornamentation with some grim skulls and crossbones. The next vault, actually an extension of the main hall and called Karlsgruft, contains the most remarkable of all morbid ornamentation in the Imperial Crypt – look out esp. for the veiled women's heads on the sarcophagus to the right, and opposite on Charles VI's sarcophagus admire the (grinning?) 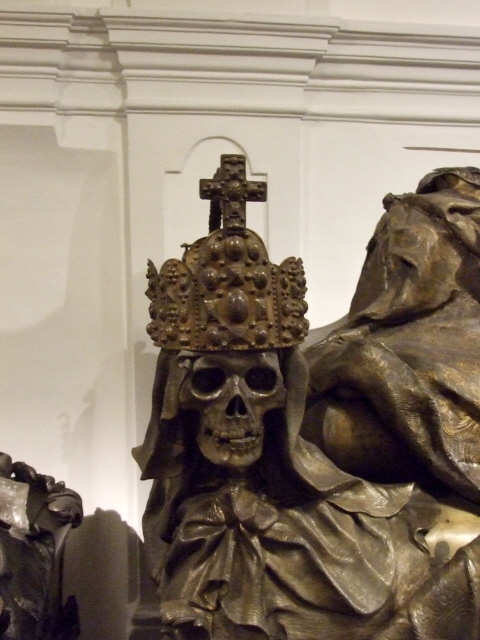 skulls bearing the crown of the Holy Roman Empire. (The original crown, by the way, can be seen in the Treasury of the Hofburg palace – together with loads of other gold-and-jewellery marvels … it's now also a highly recommended tourist attraction!). Beyond a small empty area follows the exuberant Maria Theresa's Vault. Hers is (naturally) the most over-the-top sarcophagus and dominates the ensemble in this high, domed central part of the crypt. But look out too for e.g. 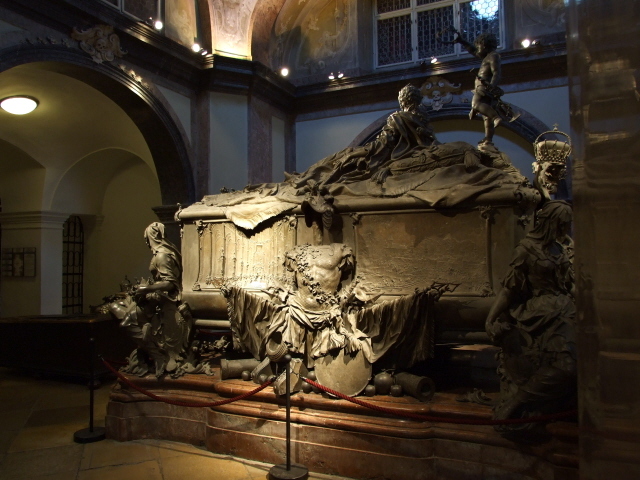 the (nearly) identically named little Maria Theresia's sarcophagus, whose lid represents her as a life-size "sleeping" sculpture. As you can see she died young, namely at the age of just under eight years. But she was still given a full-size sarcophagus. Her mother, Isabella of Parma, lies to her left in the sarcophagus bearing a particularly in-your-face skull sculpture. Note also the tiny coffin poking out a bit UNDER Isabella's sarcophagus: it's that of another daughter of hers, who had died as a baby only days after her mother's death, so it was decided to keep them (almost) together in death too. None of what follows in the rest of the crypt can top all this in morbid aesthetics at least. In fact, the new wing of the Neue Gruft ('new crypt') that follows after a series of comparatively low-key vaults is striking in its modernity. It was indeed only constructed in the 1960s in order to make for more space which would allow for better preservation work on the old caskets. The bare concrete ceiling sculpted in triangular "folds" feels remarkably plain after all the elaborate baroque/rococo ornamentation. 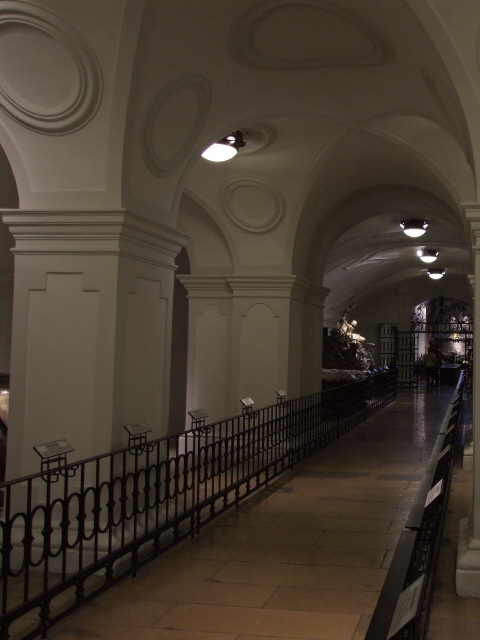 The final crypt room, branching off at the far end of the Neue Gruft, contains the perhaps most popular of all the Habsburgs, at least in contemporary public consciousness: Empress Elisabeth ("Sisi"). She was assassinated in 1898 in Switzerland by an Italian anarchist. Next to her is her husband Emperor Franz Joseph I – the last in the long reign of the great Habsburgs. He died of natural causes (pneumonia) in 1916 … This marked the end of the empire, which fell apart in World War One, after which Austria became a republic. The third sarcophagus in this ensemble is that of the original heir to the throne, Prince Rudolph, who, however, committed suicide in 1889. The final section of the Imperial Crypt is essentially post-imperial in reality. Nominally the last actual emperor, Karl I, who took over briefly after Franz Joseph's death in 1916 until the abolition of the throne in 1918, died four years later, aged only 35, in exile on the island of Madeira and is buried there. The Imperial Crypt, however, received the mortal remains of his wife, "Empress" Zita, who lived to nearly 100. 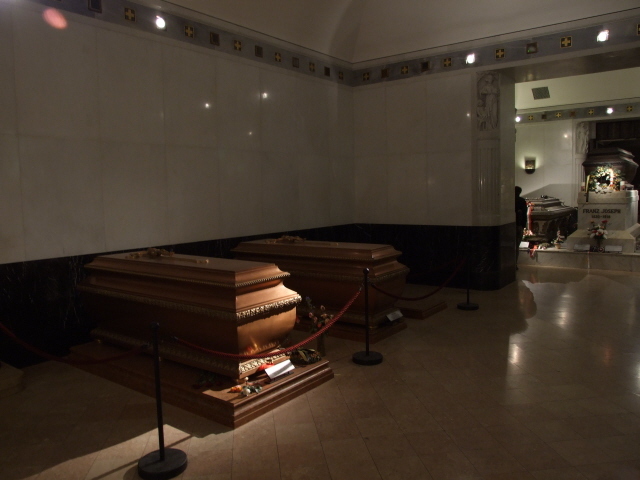 She had been allowed to return to Austria in 1982 – she died in 1989 and – remarkably – was given the posthumous honour of being placed in a copper sarcophagus in this last room of the Imperial Crypt. 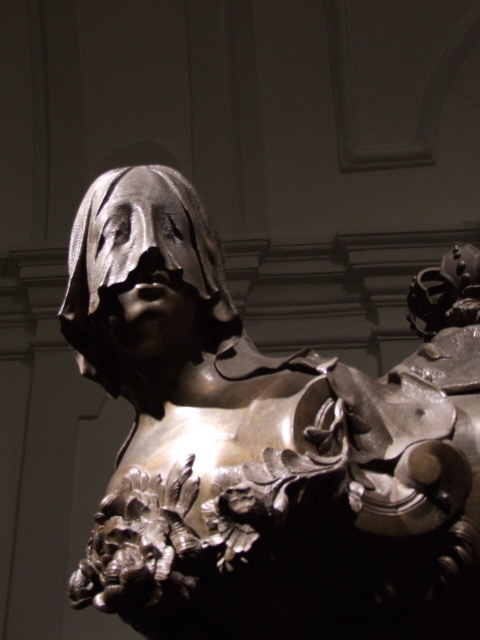 In 2008, her and Karl's son Carl Ludwig, who had died at the end of 2007, joined his mother in a similar copper sarcophagus placed next to hers. Location: at Tegetthoffstraße 2, under/next to the Kapuzinerkirche (Capuchin's church), just off Neuer Markt square right in the centre of Vienna. Access and costs: easy to get to, not particularly cheap, but not too inadequately priced. 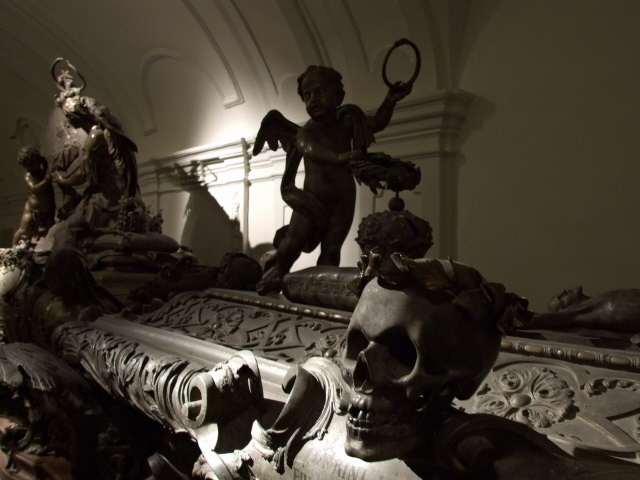 Details: The Imperial Crypt ("Kaisergruft" or "Kapuzinergruft" in German) is located bang in the centre of the inner city of Vienna, just a few steps away from one of the main central shopping streets, the Kärntner Straße. From the inner city's focal point, Stephansplatz (the square in front of the landmark St Stephen's cathedral) walk down about one-third of Kärtner Straße and turn right at Donnergasse and cross the square of Neuer Markt, Tegetthoffstraße branches off at the far end. You'll see the church portal. The crypt has its own separate entrance next to the church entrance. Opening times: daily (except 1st and 2nd November) from 10 a.m. to 6 p.m.
Time required: depends on your interest in the history and genealogy of the Habsburgs and other emperors' families. If you only want to take a good look at the magnificently gothic sarcophagus designs and savour the morbid atmosphere of the place, then you can be out again after a mere 15-20 minutes. If you really want to delve into the background too, then up to an hour and a half can be spent down here (that's how long guided tours take!). Combinations with other dark destinations: Thematically, and atmospherically, the Imperial Crypt has to be combined with a visit to the other parts of those deceased emperors etc. : the intestines in the catacombs of St Stephen's cathedral in particular (guided tours also include a look at the catacombs proper, where thousands of bones and skulls of far less aristocratic deceased Viennese are piled high). You may also want to say hello to the hearts, which are stored away separately too, namely in a row of urns in a small side room of the St Augustin chapel of the Hofburg palace complex (the "Herzgrüfterl" – literally 'little heart crypt', but the "-erl"-Ending is also an affectionate diminutive suffix … only in Vienna!). Close by is yet another crypt that warrants a visit – in fact perhaps more so than any other in Vienna: the Michaelergruft, the crypt under St Michael's church on Michaelerplatz in front of the main palace gate in the heart of the city. This is a lot less grand than those emperors' tombs, but a lot darker in atmosphere, containing naturally mummified corpses on full display! For dark si(gh)ts in general and further away from the inner city see under Vienna. Combinations with non-dark destinations: in general see Vienna – the Imperial Crypt is right in the centre of Vienna's First District, so many of the city's premier sights are only a stone's throw away – the opera, the Albertina (art/graphics museum), the Hofburg palace, St Stephen's cathedral, and the inner city luxury shopping streets of Kärtner Straße and Graben.